Have you paid? Associate members will not be able to continue their course without it - it's an insurance requirement and full members will not be covered and able to ride with us either..
We have made it simple to renew either by BACS/PayPal or cash so do it now if you haven't! Single - £18 cash/cheque, £16 by PayPal or £15 - bank transfer/standing order. 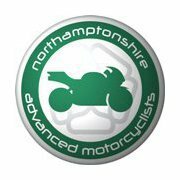 NAM are happy to offer test passed riders of all ages and experience the opportunity to see first hand the benefits of advanced riding techniques. These sessions are genuinely FREE and without obligation. If you wish to enjoy a few hours out on your bike with a bunch of like minded people then why not come down and see us? We meet here every Sunday* at 9:15am. No need to book, just turn up and we will take care of the rest. You really do have nothing to lose and much to gain in improved skills, safety and confidence. Meet at - Obelisk Centre, Obelisk Rise, Kingsthorpe, Northampton. NN2 8UE at 09:15am. Observes, social rides and free 'look sees' all available. We depart 09.30am.